Opera is not a cheap art form. Performed traditionally (in an opera house with sets, costumes, etc. ), it is very expensive to produce and it is not cheap to attend. Fortunately for Bay Area residents, there are cheaper ways to enjoy opera: we've got free telecasted operas at AT&T park and standing room at the War Memorial Opera House. 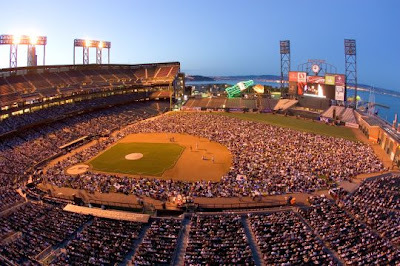 Last Friday, 27,000 of my best friends and I attended Puccini's Tosca shown live by telecast at the AT&T ballpark in San Francisco from the Opera House. This is the most people that have ever attended this event. What a unique and bizarre way to watch an opera: blankets, beer, soda, wine, seagulls sandwiches, popcorn, scarves, hotdogs, whatever. It was even weirder noticing that right above the center of the huge 1920x1080 high definition digital screen was a Budweiser ad. The audience booed the villain, cheered the heroine and tried not to yell at people who were talking too loud (Some didn't do so well, you know who you are!) This is the way opera was meant to be seen and how theater was experience hundreds of years ago. Watch out though, the sound system is so good that you might need earplugs for some of those high notes! The next live telecast will be on September 19th at 8pm and the opera will be Il Trovatore by Verdi. I HIGHLY recommend that you check it out if you can, even if you're not sure if you like opera. Maybe combined with the ballpark experience, you can ease your way into it. Over the weekend I also had the privilege to get a sneak preview of the new Porgy & Bess production. This is an amazing production and a gorgeous show all together. I had seen it in Los Angeles when I was a child and really didn't fully understand the story. Knowing more about the history of the opera and Gershwin I, obviously, enjoyed it much more. One of the things I learned about Porgy & Bess is that when it was first premiered in New York in 1935, it was not well received. People liked it, but it did not have enough staying power to become an immediate classic. While it was performed in pieces in years after, it was not until 1976 when the Houston Grand Opera resurrected the opera mostly in it's entirety. 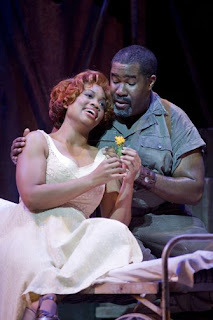 Porgy & Bess has now joined the canon as one of the most popular American operas of all time. It was not well received in the 30s due to the African American stereotypes of some of the main characters: the cripple/begger, the "loose" woman, the drug dealer and the violent man. This makes sense considering the ideals during the Harlem Renaissance to "lift the race through art". It seems that by the 70s, the white and black artistic communties felt comfortable enough to perform the opera and that enough time had passed for audiences all over the country and the world to see it as more than just a racial stereotype.